Iranian Foreign Minister Mohammad Javad Zarif (C-R) welcomes with his German counterpart Frank-Walter Steinmeier (C-L) in Tehran, Oct. 17, 2015. 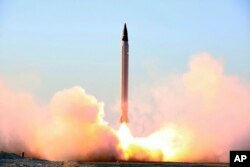 Iran has rejected U.S. and French allegations that its recent long-range missile test violates United Nations resolutions, saying the Security Council restrictions only apply to missiles designed to carry nuclear warheads. Speaking Saturday in Tehran, Foreign Minister Mohammad Javad Zarif said "none of the Islamic Republic of Iran's missiles have been designed for nuclear capabilities." "The Islamic Republic of Iran has proved and shall prove again that nuclear weapons have no place in our defense doctrines and never shall have a place, therefore our missiles have never been designed for carrying nuclear warheads because we have never planned on having nuclear warheads and shall not either," said Zarif. Zarif's comments came a day after U.S. Ambassador Samantha Power referred to the October 10 launch of a medium-range missile. She said the missile was "inherently capable of delivering a nuclear weapon," and said Washington will respond with “appropriate action” in the U.N. Security Council. Alongside Zarif Saturday, German Foreign Minister Frank-Walter Steinmeier said he would not use media reports as a basis for deciding whether violations of international law had occurred. "All sides are bound not to destroy this trust that has been built up," Steinmeier said. "I cannot judge based on press reports whether they were violations of international rules, but to avoid a public discussion about it and to make sure there are no misunderstandings, I can only advise that what is needed is the highest possible transparency, with American partners too, and that the language of escalation should be avoided where possible." Power told VOA the alleged violation was unlikely to affect implementation of the July nuclear deal agreed between Tehran and the six major powers. “We are getting close to the beginning of the implementation period, and I think that will go forward. It is in everyone’s interests to see the dismantlement of Iran’s nuclear weapons program as quickly as possible,” she said. “But we have got to do both at once – we have to hold Iran accountable for its violations of U.N. Security Council resolutions and we have to move forward and ensure that it does not pose a threat and does not obtain a nuclear weapon,” Power said. ​VOA's Margaret Besheer contributed to this report.